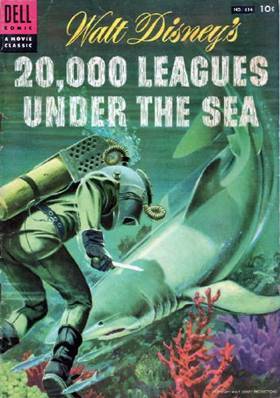 Walt Disney’s movie version of Jules Verne’s 20,000 Leagues Under the Sea gave audiences a view of an underwater world they’d never seen before. But the story of the efforts required to film those scenes, and the amazing achievements of the people who did it, is a modern day Odyssey in its own right. 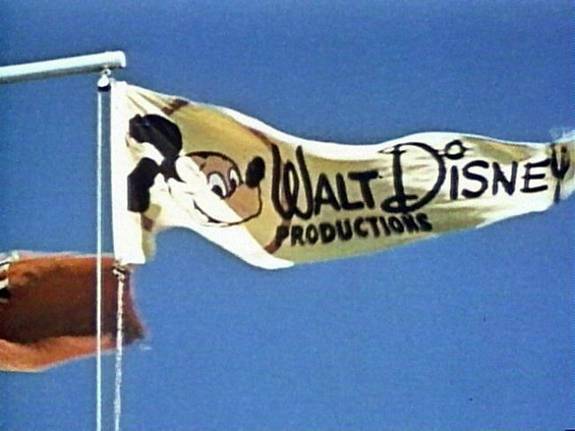 In 1954, Disney Studios sent a small fleet of vessels to the Bahamas under this very familiar banner. 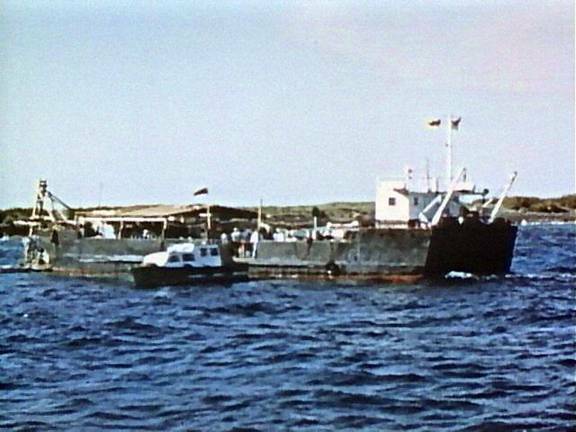 The principle dive barge (a converted U.S. Navy LCT) was accompanied by numerous smaller support vessels, and served as a floating nerve center for the underwater filming operations. Here, we see the Disney crew lowering one of their specially adapted cameras into the water in preparation for a shot. 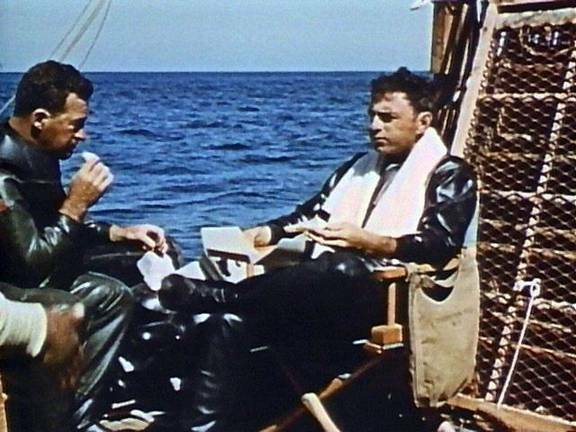 Weather permitting; the crew dived in the morning, and again in the afternoon. The coordination and skill of the people who performed this work was impressive indeed. 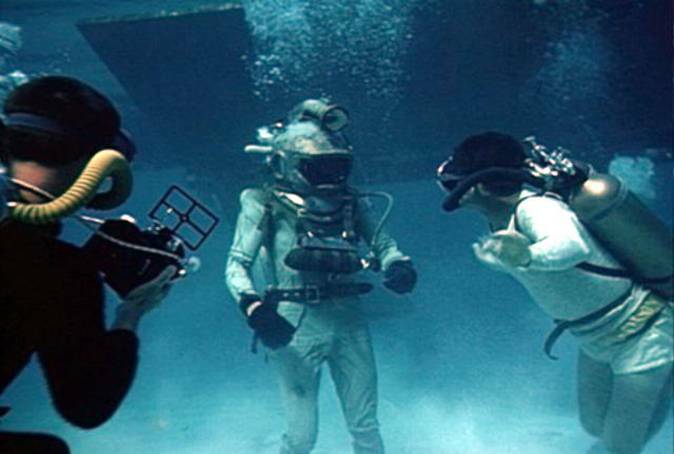 Filming the underwater scenes for Leagues was the greatest technical feat of its kind ever attempted. Nothing on this scale had ever been done before. 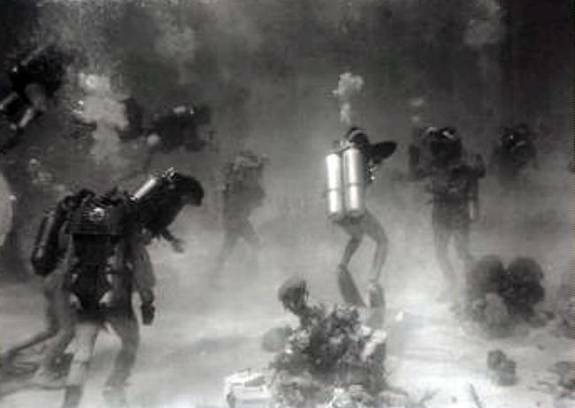 The operation was so unparalleled, and the photographic methods were so revolutionary, that the United States Navy sent observers along to film the operation and see what they could learn about underwater photography from the Disney team. 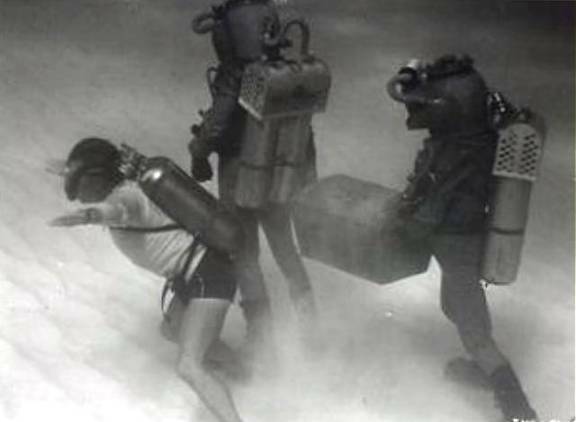 In 1954, SCUBA diving was still in its early years. The equipment seen in the movie was experimental. 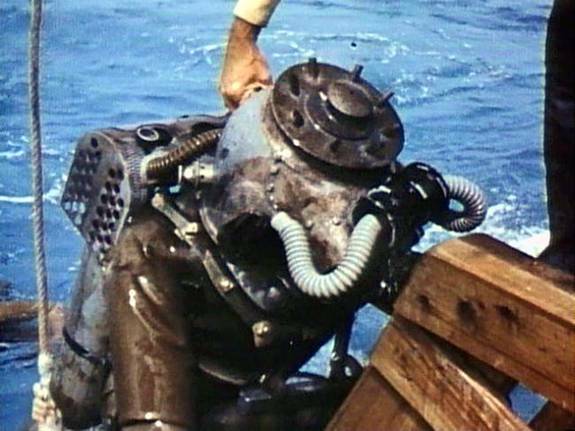 Conceived and perfected by people like Harper Goff, Fred Zendar, and Al Hansen, the Disney diving systems combined hard-hat and SCUBA gear with unique art-metalwork that was out-of-this-World. The rigs were tremendously heavy: well over two hundred pounds each. Because of this, safety protocols required that each individual diver had to have several assistants to help him in and out of the water. 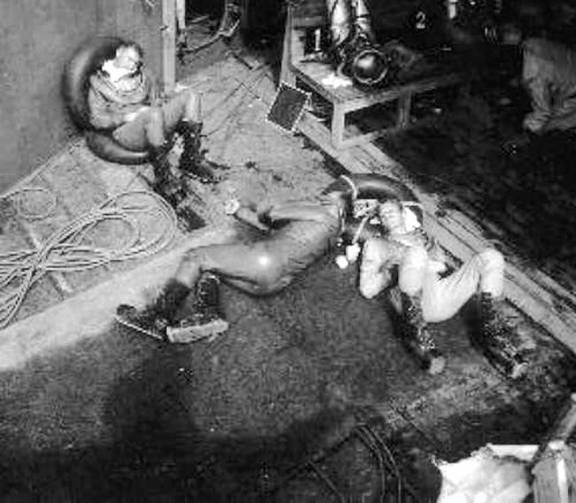 Once aboard the barge, the divers were guided to numbered seats on benches where tenders would remove and service their gear, and the air tanks could be recharged for the next dive. 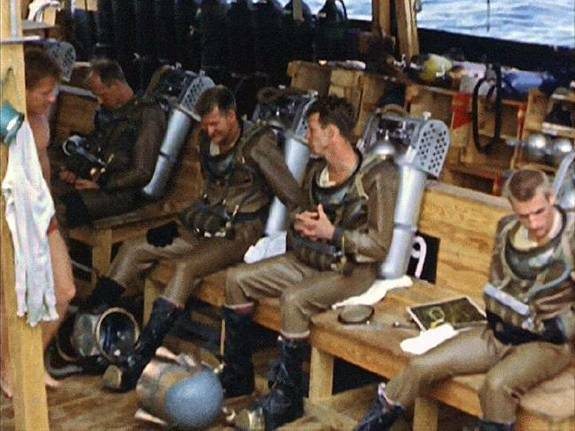 Here we see some of the Disney Divers all geared up and ready to go. That’s Ricou Browning in the #9 station. 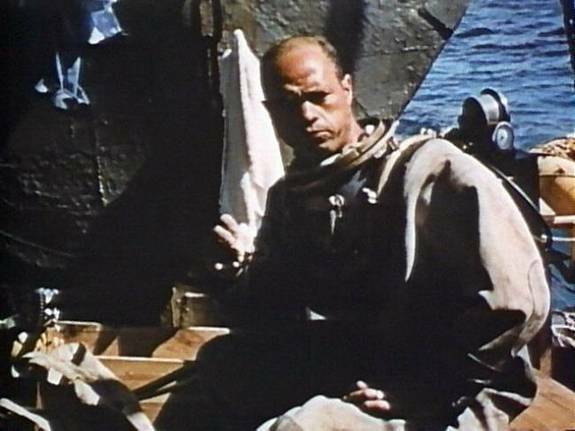 Ricou is also well known as the diver who played the monster in the underwater scenes for Creature from the Black Lagoon. 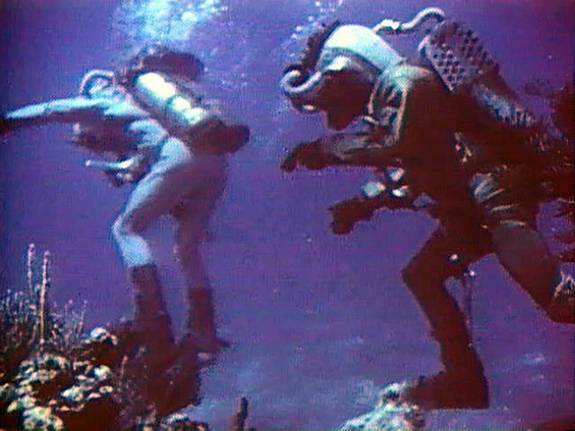 Al Hansen is the seated diver on the left, and Canadian diver Leonard Mott is the diver on the right side of the picture. 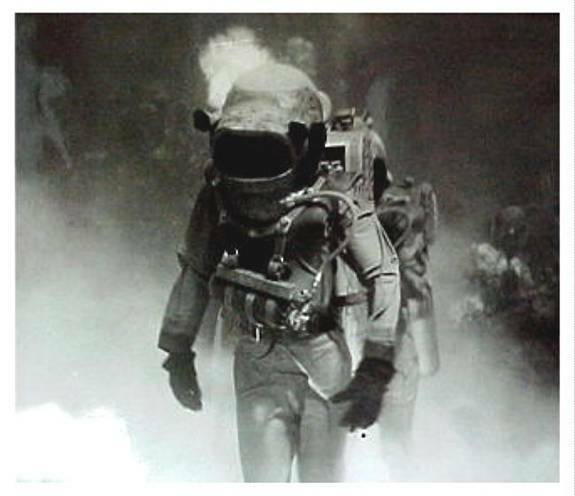 The diving suits came in three basic types: there was one for Captain Nemo, distinguished by the gray suit and the headlamp atop his helmet. Twelve were made for the crew with the distinctive “crown top” helmet. And five of the third variant (dubbed the “Baldy”) were also made, for a total of 18 rigs in all. 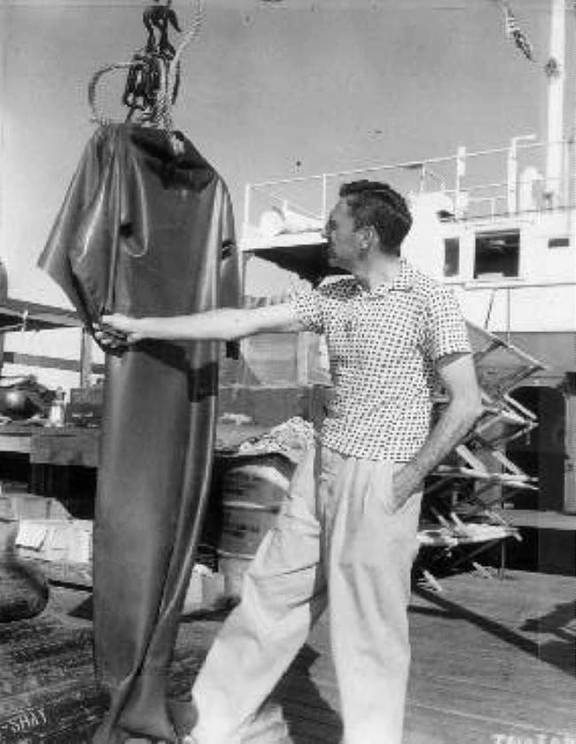 Production Designer Harper Goff realized the divers of the NAUTILUS could not be clad in anything the audience would recognize as modern equipment, and what he came up with was truly unique. Of course, conventional diving equipment played a part, too. 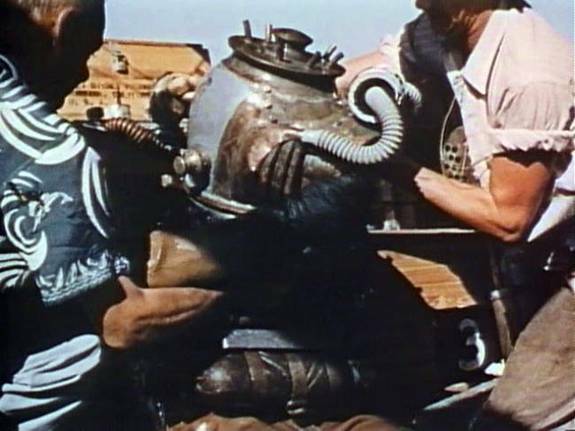 Here we see the production Safety Diver dressed in his MkV diving suit. 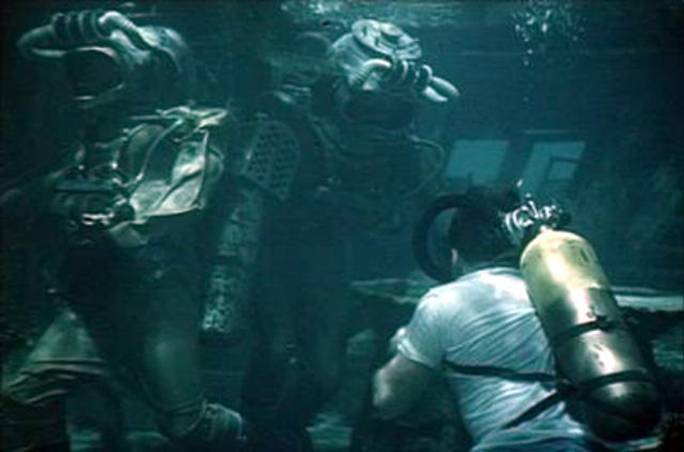 The film crew used standard SCUBA gear, too. With all those people running around underwater, things must’ve gotten pretty hectic at times…. …so whenever possible it made sense for the divers to conserve their energies. But for Director Richard Fleischer and underwater cameraman Till Gabbani, there wasn’t much downtime. Lunch was just another opportunity to plan and organize what was going to happen next. Some of the props used underwater were remarkable in their own right; like this full-sized replica of the NAUTILUS stern section, used in filming the “fixing the faulty rudder” sequence. Here, we see underwater cameraman Till Gabbani swimming through the scene as the divers go about the business of repairing the damaged rudder. 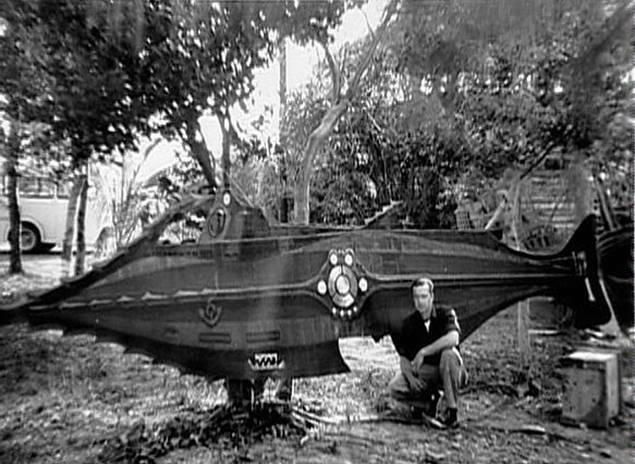 This two-dimensional NAUTILUS prop was intended for placement in the background behind the divers during the underwater scenes, to simulate the submarine standing by at a distance. If it was ever used, none of the footage made the final cut. 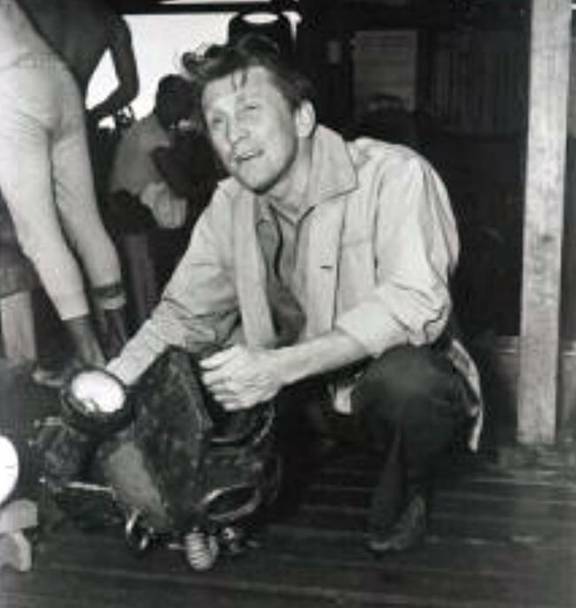 Being an athletic type who frequently played action roles, it’s no surprise Kirk Douglas was very much interested in the dive operation. Here, we see Kirk on the dive barge, examining the Nemo Helmet. 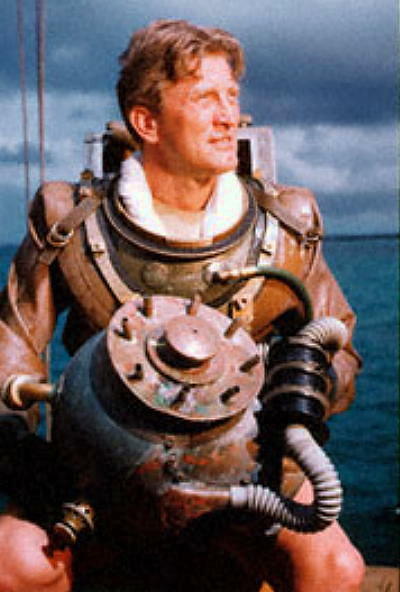 Here, we see Kirk suited-up in a Crew Diver rig like the one his character Ned Land wore. Did he actually dive it? Read on…. 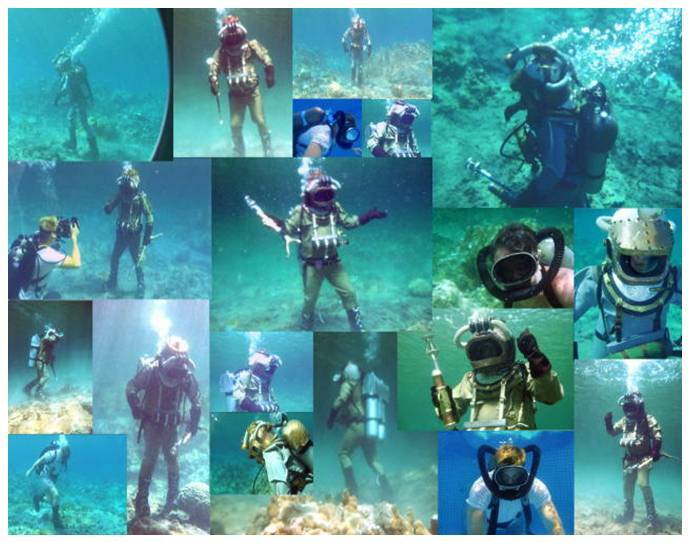 Here Kirk is apparently getting ready to make a SCUBA dive in conventional gear. I don’t know if this is where he learned to dive or not, but maybe this was part of the process of the dive crew breaking him in? 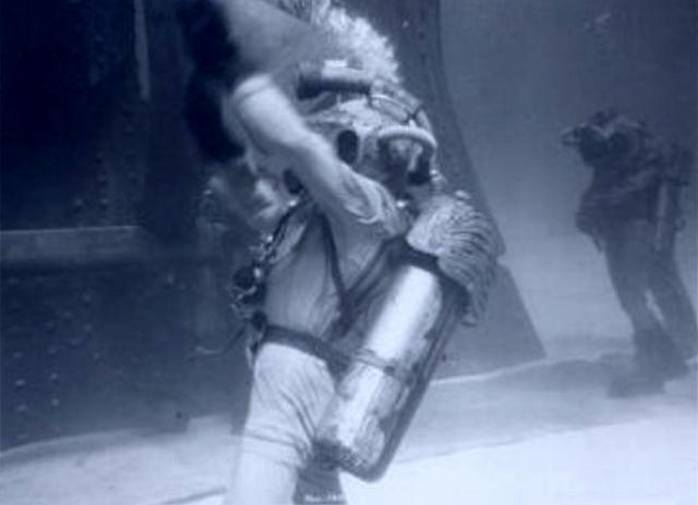 Here’s a B&W shot of Kirk in the DIVER suit, apparently taken at the same time as the color picture above. He looks wet, so I figured this was a post-dive photograph. Several years ago, Harry Hathorne told me the event had been staged. “They just hit him with a bucket of water and shot the picture,” he said. For a long time I wasn’t convinced, but look closely. The shoulder straps should travel over the top, and back down under Kirk’s armpits to the tank harness bands behind him. Instead, they are merely draped over his shoulders. You wouldn’t dive this equipment rigged like that. The tanks could fall off, tear the air supply hose from the helmet, and if that happened you’d be in big trouble. So, it looks like Harry might have been right all along. Did Kirk ever dive a Leagues suit? I don’t know. But I have to admit that this photo does appear like it could have been staged. 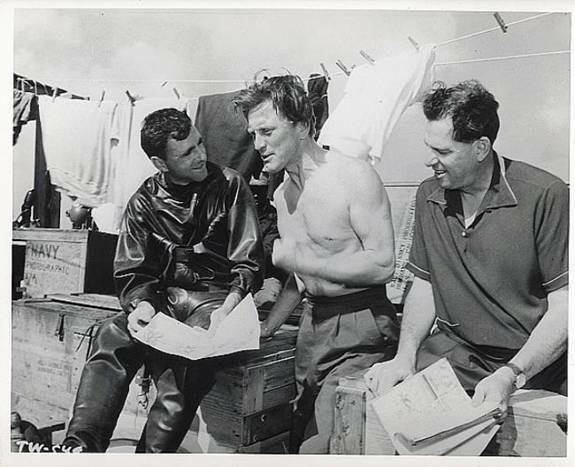 Here we see Kirk Douglas (looking a little wet) speaking emphatically to Screen Writer Earl Felton and Director Richard Fleischer (in the drysuit) on the dive barge. 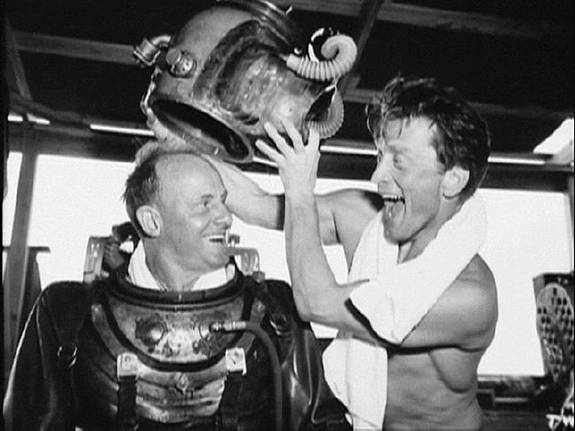 And here’s a picture of Kirk clowning around with veteran commercial diver Al Hansen: one of those involved with developing the Disney diving rigs, and the diver who played Kirk’s character Ned Land in the underwater scenes. 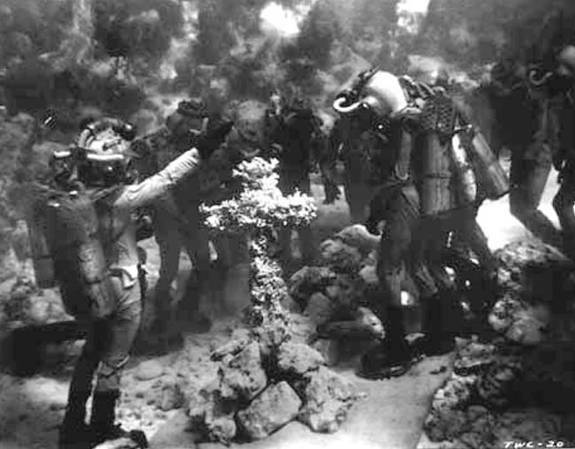 A group dive operation of this size posed unique communication challenges. 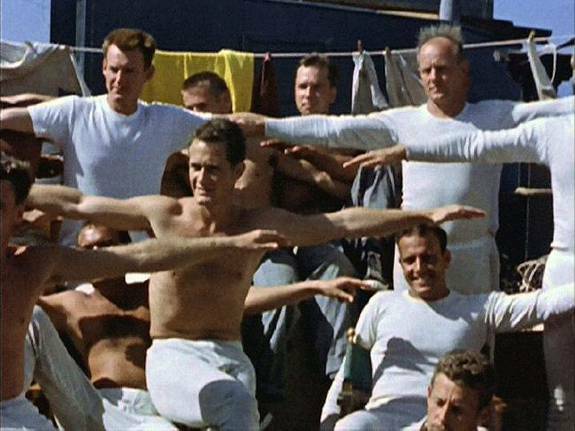 Here we see the Disney Divers aboard the dive barge, practicing the hand signals they’d rely upon underwater. Complicated dive sequences had to be worked out beforehand so every participant understood what his role would be, where he’d be in relationship to the camera, and so on. Here we see the crew “dirt diving” the famous Burial Beneath the Sea scene. 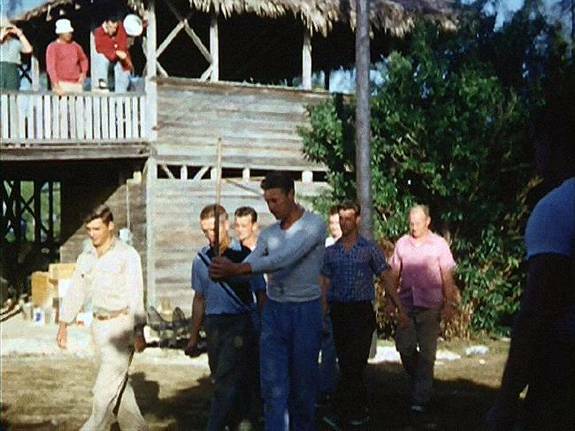 That’s Captain Nemo in the foreground: the stick in his hands represents the coral cross he’ll be carrying. 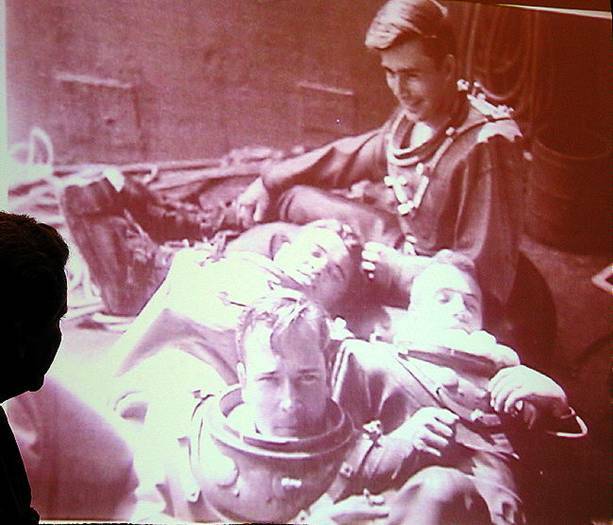 And beyond him, the crew of the Nautilus is carrying the “body” of one of their deceased comrades: in this case, a litter bearing a wire-mesh mannequin. Here we see Director Fleischer “deck-diving” the next scene with the crew. The details of how each dive would go had to be clearly understood by every man in the water if the shoot was to be a success. That’s Fred Zendar behind Fleischer, and Norm Bishop behind the blackboard. When the discussion stopped, the diving started. 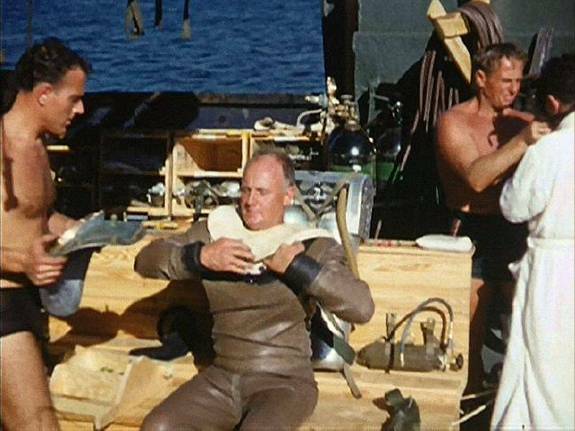 Here, we see Stunt Diver Leonard Mott assisting the Captain Nemo Diver as he prepares his equipment. A close-up of the real Captain Nemo, while performing a pre-dive air system check. 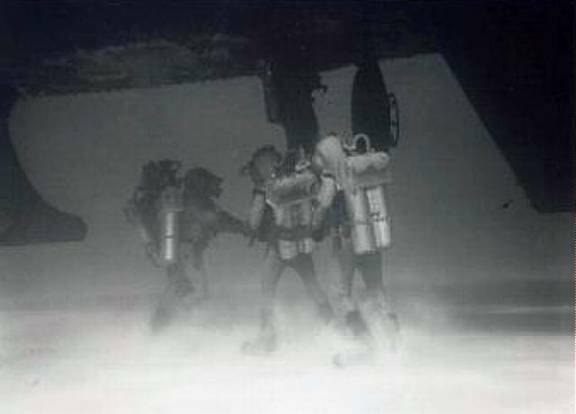 Though the suits were very heavy, once in the water their buoyancy made them almost weightless, and the divers were able to travel by great leaps and bounds across the ocean floor. 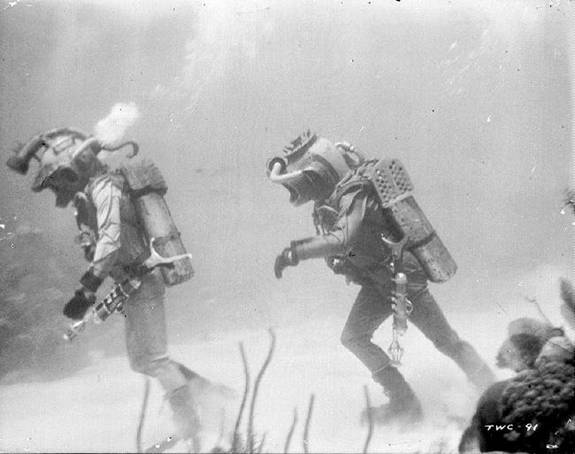 In this screen capture from Disney’s OPERATION UNDERSEA, Captain Nemo and Professor Arronax leap from one coral head to another, like astronauts on the Moon, effortlessly floating through inner space. 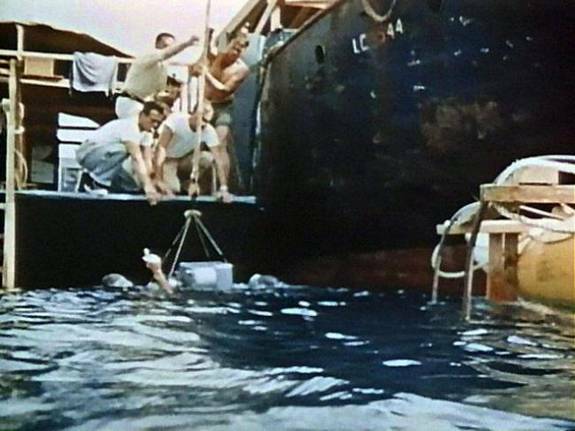 But transporting divers from one site to another didn’t rely on walking: they hung from knotted ropes suspended from an Avon rubber boat, and were towed about on this improvised “underwater taxi”. 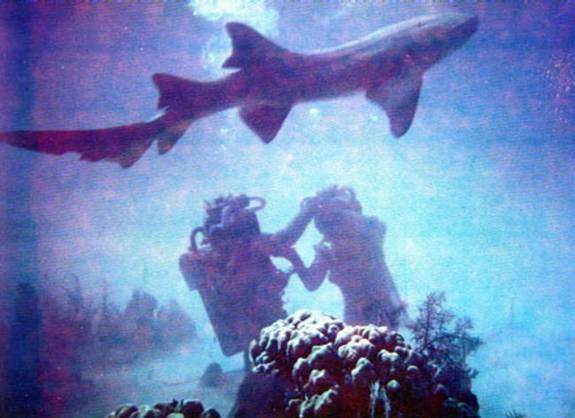 And thus, some of the most memorable underwater images ever seen (like the famous Burial Beneath the Sea sequence) were filmed. 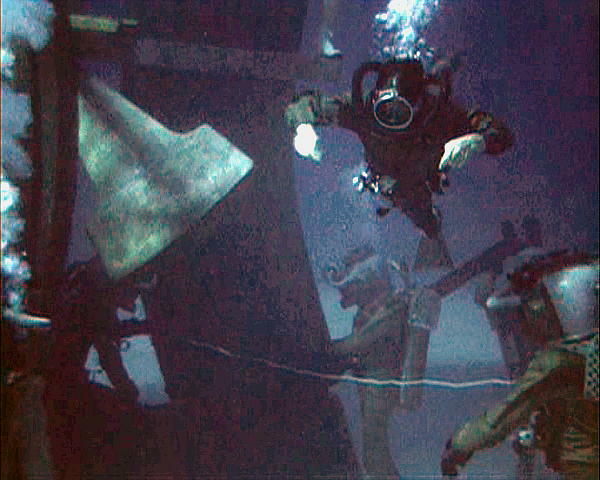 Some scenes, like this one of Ned and Conseil inside the sunken galleon (subject of a well-known Disney lobby card, and the famous painting by John Steel) were actually filmed later in the 12-foot deep end of the Stage 3 tank at Disney Studios in California. 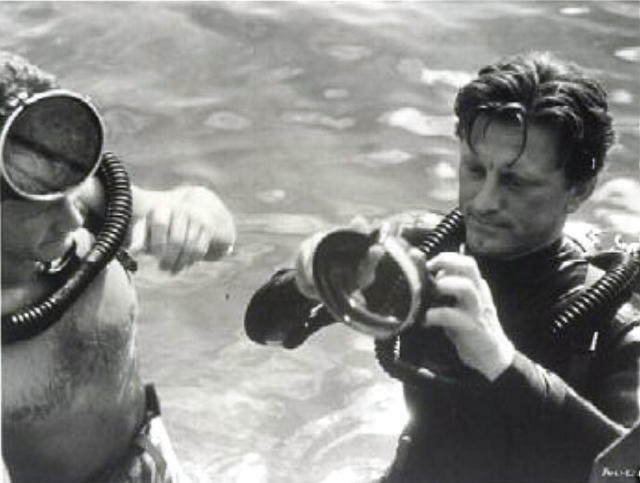 Divers Al Hansen and Norm Bishop portrayed Ned and Conseil for the scenes shot on location in the Bahamas; but on at least one occasion here in the tank the divers were F. Donahue and D. Rochlen. At other times, Norm Bishop and Ed Stepner did the honors. Supervising underwater on these days of filming was Fred Zendar. But most of the diving was done on location in the Bahamas. 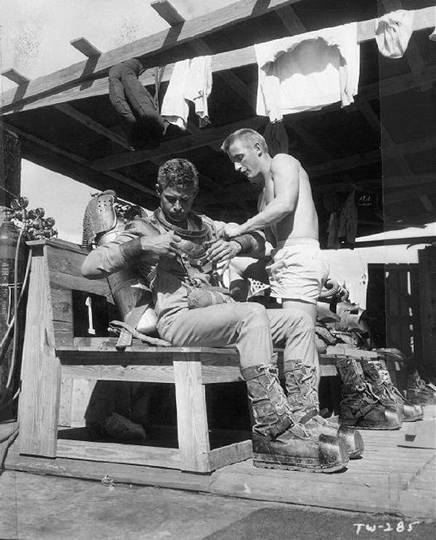 Here we see Al Hansen getting ready to go: adjusting a foam shoulder pad prior to receiving the breastplate for his helmet from Ed Stepner. 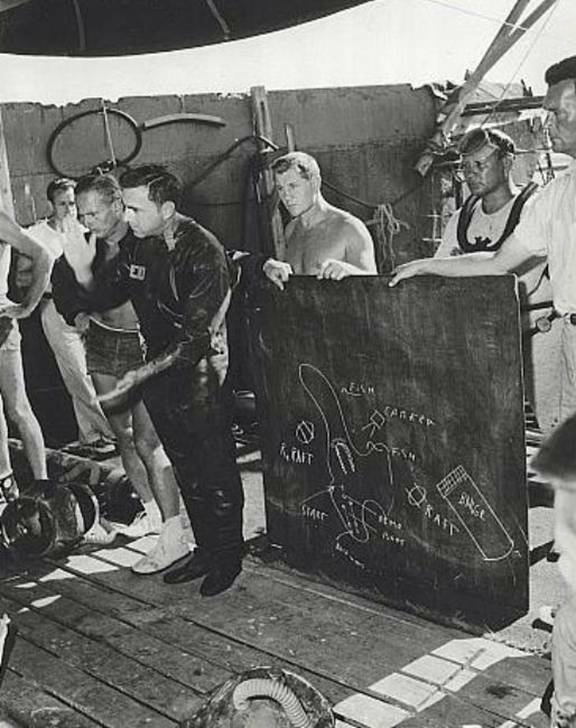 To the right we see Disney Divemaster Fred Zendar (in swim trunks) working with another member of the crew, possibly Fleischer. The famous scene where Ned and Conseil encounter a shark was filmed live in the Bahamas. 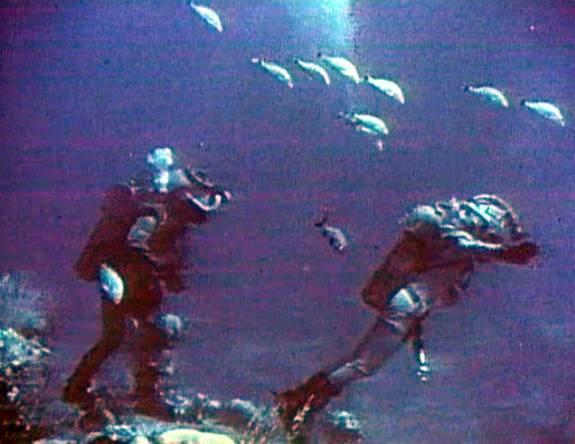 The divers for this episode were Al Hansen and Norm Bishop; and the nurse shark was definitely NOT animatronic. 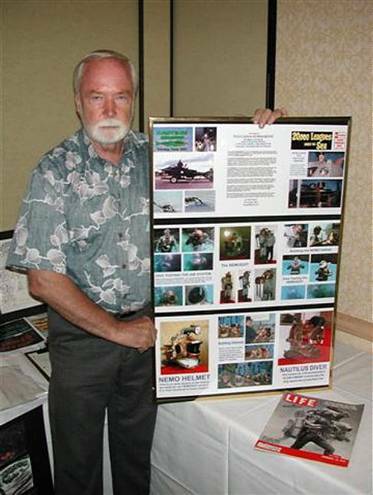 At the 20,000 LEAGUES EXPO in Anaheim, July 2003, Disney Diver BILL STROPAHL made a personal appearance and shared his experiences with assembled fans. 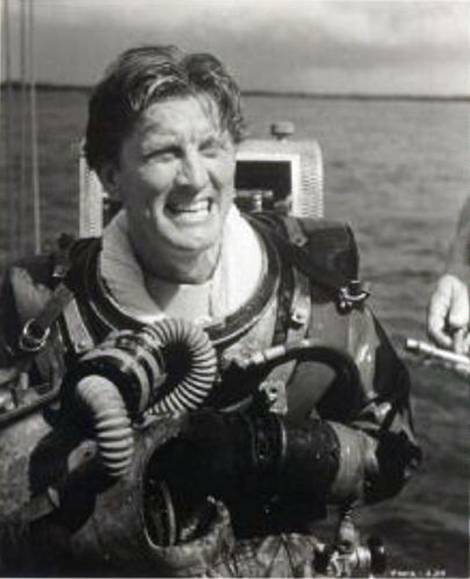 Here, Bill is speaking to Paul Brooks about the emergency air bottle on the diver’s chest. 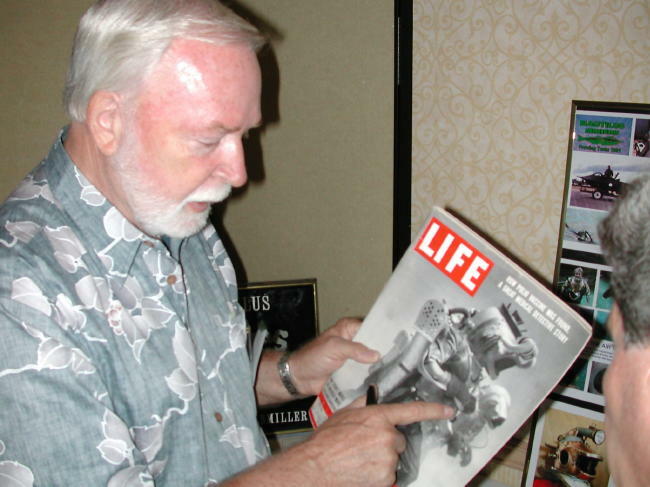 Bill would certainly know about that particular dive suit shown on the cover of the 1954 LIFE Magazine he’s holding: he was wearing it when the photo was taken. Being mid-Pacific islanders ourselves, we weren’t able to attend the EXPO on the mainland; but VULCANIA SUBMARINE was represented by a photo display outlining the Leagues-related projects we’d built up to that time. Bill did us the honor of posing for the cameras with our display. 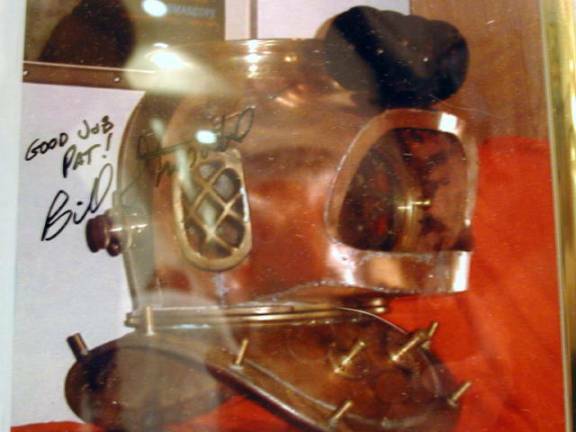 Bill Stropahl also honored us by autographing the photo of my (then) in-process NAUTILUS DIVER helmet. Here’s a closeup of the display taken at the EXPO by Wayne Orlicki. (The glare is a reflection on the acrylic cover of the framing; the autograph is on the photo itself.) Apparently, Bill really liked our work. Coming from a guy who actually dived the real rigs for the movie, his complement means a lot to me. This photo display has become a favorite part of my collection. 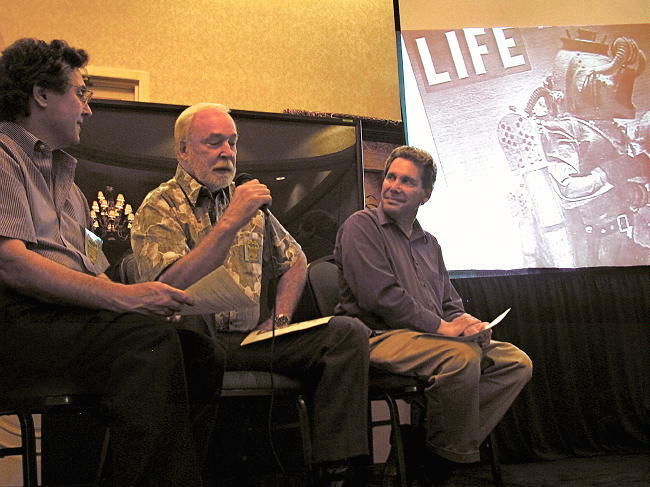 Bill Stropahl narrates a slide presentation about his experiences as a Disney Diver at the 20,000 LEAGUES EXPO. For this occasion, Bill was joined by the Brooks brothers, Larry (left) and Paul (on the right), both of whom are well known and highly respected for their knowledge and dedication to the movie. Here’s one of Mr. Stropahl’s slides. That’s Bill front and center, with his fellow divers on location. Sadly for us, Al Hansen, Norm Bishop, and many of the other Disney Divers have passed on. But the movie they all made has become timeless; and their work still continues to amaze and inspire new fans almost 50 years later: a truly remarkable achievement. 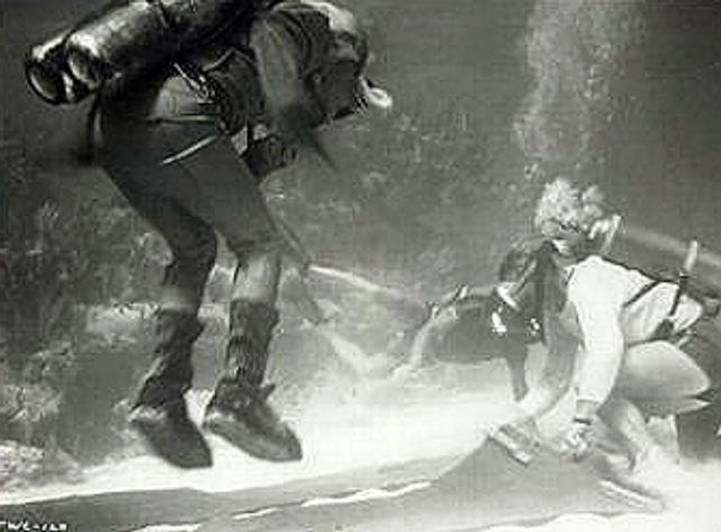 Recently, Harry Hathorne and I asked Disney to produce a program honoring THE DISNEY DIVERS. So far we have had no success. As Captain Nemo said, “There is hope for the future.” But whether such a program is ever made or not, as long as this Website exists the Disney Divers will not be forgotten. Special thanks to Harry Hathorne, Larry Brooks, Ty Bumgardner, and Wayne Orlicki for graphic contributions and support. Ty Bumgardner provided us with this excellent screen-grab from the DVD of the moment Nemo fires at the shark to save Ned and Conseil, and the projectile is clearly visible as a red streak exiting the rifle barrel: one of numerous special effects added to the footage that many never realized was Disney animation. 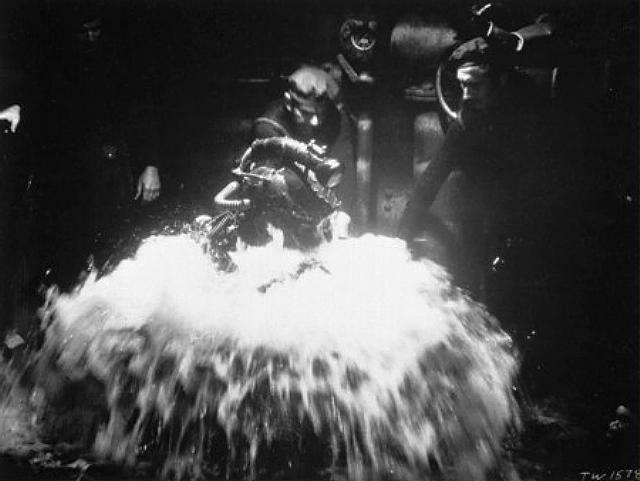 Here’s a still from Harry Hathorne’s collection showing an early test of Nemo entering the diving chamber. In this scene, he had to climb up and out of the lockout hatch: not easy in a rig weighing over 200 pounds! Harry told me these scenes were filmed in a stage built over the wet-set at Disney Studios. There was a diver down below with a fire hose, creating all that foam we see surging into the chamber. Ty Bumgardner also sent us this screen grab from the DVD showing how the final stunt was aided by the use of a “grab bar” overhead. Still, this was no easy feat. Having worn a replica Nemo suit, I know the diver’s upward visibility is so limited he made this grab on “blind faith” alone. Then, lifting a heavily-weighted SCUBA rig and diving boots over the lockout combing and into the set (while making it look easy) represents a seemingly superhuman athletic accomplishment. 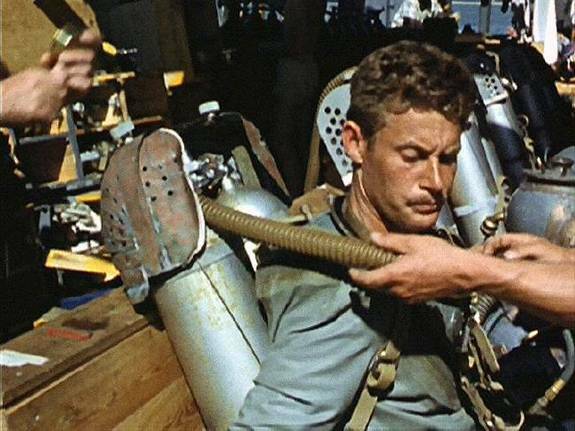 Based on what we’ve learned by actually operating rigs like this; and what we know about how Leagues was filmed; we at VULCANIA SUBMARINE are of the opinion that this was probably one of those scenes where lightweight replica SCUBA tanks and dive-weights were used. That would have been within the equipment’s capabilities. Here’s another look at the Safety Diver in his MkV gear, on location in the Bahamas. Notice the twin air hoses with tips attached, spewing air bubbles into the water. 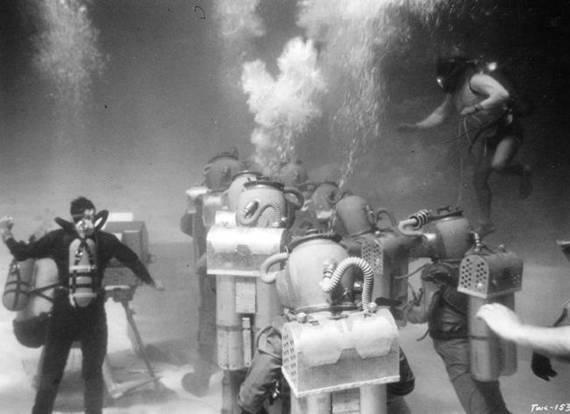 The Disney LEAGUES diving apparatus was equipped with quick-connect adapters. In the event of an emergency, the Diver could use his chest-mounted pony bottle and raise his hand to indicate distress, whereupon he’d be extracted to the surface as soon as possible. 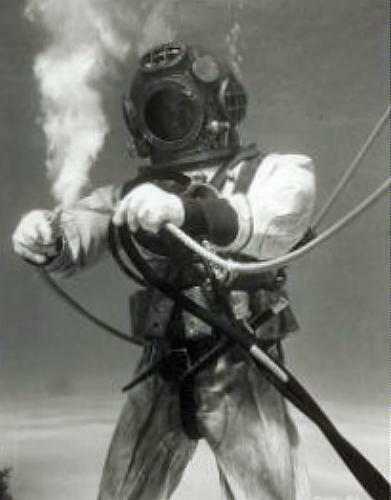 Beyond that, if the need arose, the Safety Diver was equipped to connect the LEAGUES diver to an air hose, which would provide a virtually unlimited supply of air, just as if he were breathing from a surface-mounted compressor as the MkV diver does. Obviously, safety was a primary concern, and Disney took extra precautions to ensure that options were available if necessary. A rescue diver hovers above the actors during filming, ready to respond in case of an emergency. 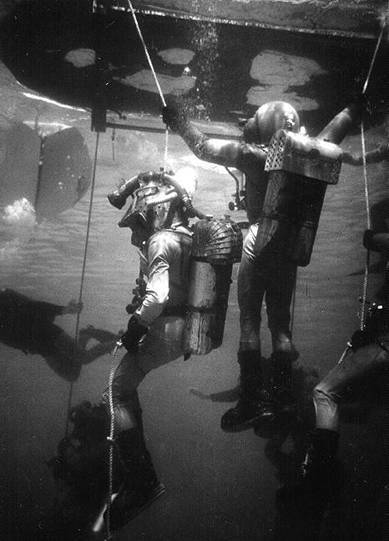 There was one rescue diver for every two “crew actor” divers, and two for each of the main characters. 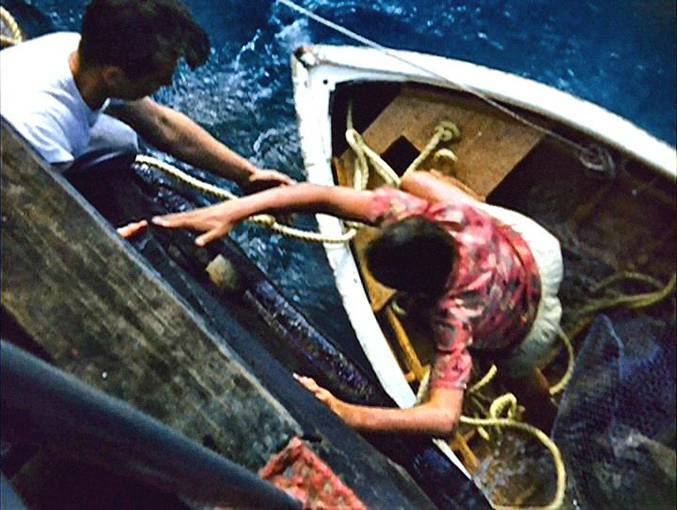 If anything went wrong, the rescue divers could swim a man to the surface in a few seconds. I believe that’s Fred Zendar making like an umpire calling the runner “Safe!” Actually, the signal is for everyone to stand by for action; the next signal would be for the scene to begin. Behind Fred, divers Al Hansen and Norm Bishop wait with a chest of sunken treasure. 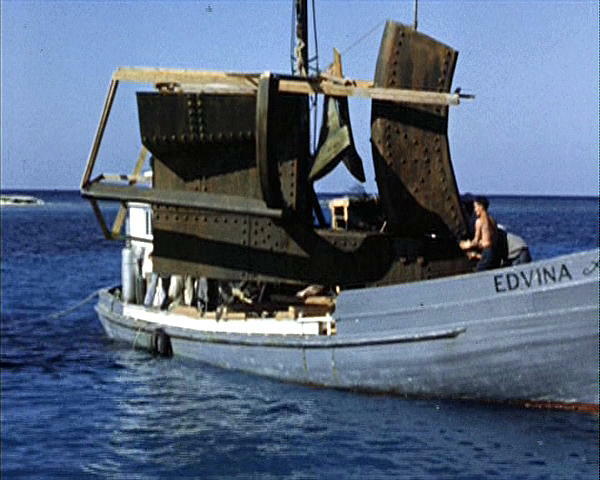 For scenes like the one above, a full sized replica of the diving hatch area of the NAUTILUS keel was built and suspended from the bottom of a barge on location. Ever wonder how the heavily-weighted divers were able to rise up into the hatch? Underwater, the LEAGUES suits have only a slight negative buoyancy. A diver can leap upwards and ascend a considerable distance. Temporarily closing off the helmet exhaust valve and adding a little air to the suit to increase buoyancy, could have also enhanced the jump. But in this case, they were on a wire being pulled up from above. From the collection of Harry Hathorne: a picture of Captain Nemo getting a little direction underwater, with what looks like the NAUTILUS keel prop in the distance behind them. 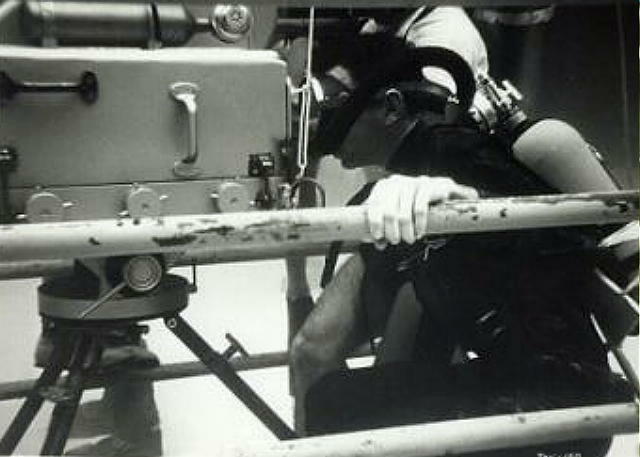 Director Richard Fleischer at the pressure-compensated underwater movie camera. A diver hops upwards so Fred Zendar can adjust one of the hemp carpets used to keep down the clouds of silt that kept billowing up every time the divers walked through the area. His body position is very much like the diver shown on the cover of the well-known DELL 20,000 LEAGUES Comic Book, and this picture may have been a reference used for that illustration, as seen below. Captain Nemo supervising the NAUTILUS crew making repairs to the rudder. On the seabed we can see one of the hemp carpets used to keep “silt fog” at a minimum. 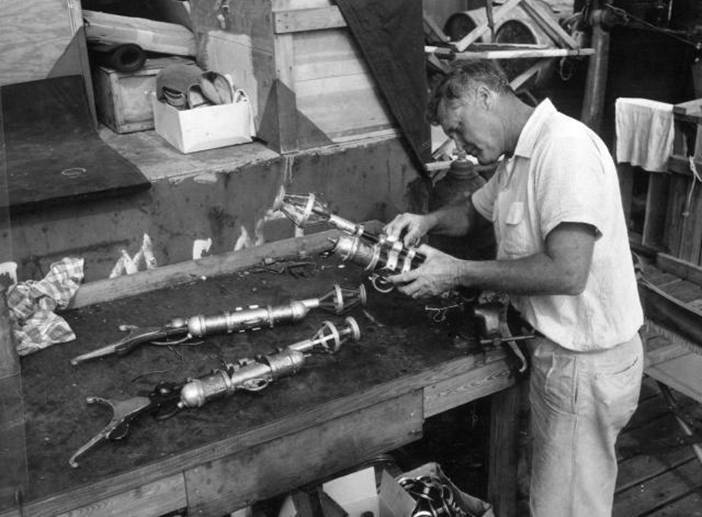 A Disney prop man services one of the underwater rifles. In the cardboard box below the table, we can see a large number of the “spools” used to make the “air filter” device on the visor of the crew diver helmets. Today, these things are extremely hard to find. 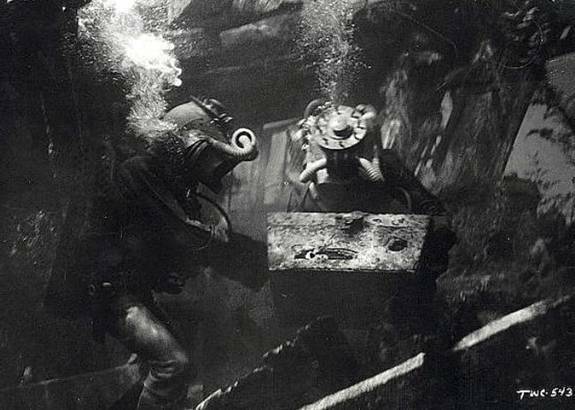 This scene was shot in a tank in California: this is where Ned and Conseil are inside the sunken ship and find the treasure chest. The divers are either F. Donahue and D. Rochlen, or Ed Stepner and Norm Bishop. All four worked on the Galleon sequence. 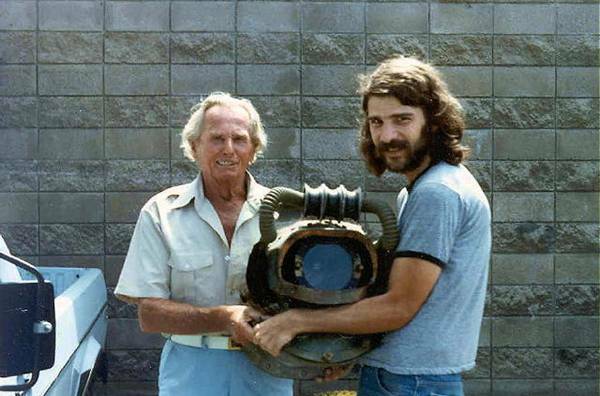 Way back in the 1980’s, friends Fred Zendar and Harry Hathorne took a moment to pose for the camera with one of the actual helmets used in the filming of 20,000 LEAGUES UNDER THE SEA. There are very few of these still around: many had the art metalwork stripped off after shooting was complete. Most of those that still exist are in private collections, and in some cases their whereabouts are known only to trusted friends as a matter of security. This page was conceived as a tribute to those Disney Divers who did so much to make 20,000 Leagues the masterpiece it turned out to be. But it seems to me our greatest tribute to those folks is found in the functional underwater technologies they inspired us to replicate. Few will ever know all that went into these projects. Nowadays, Information that (largely due to disclosures made by VSC) is fast becoming common knowledge, I had to discover through countless hours of personal research. Details of how Disney’s Leagues suits were built and operated, I had to learn through my own experimentation. Not to mention the time, effort, and money that went into creating the tooling to make these rigs; and then, to manufacture the rigs themselves, by hand, while working alone in a small home-based shop. 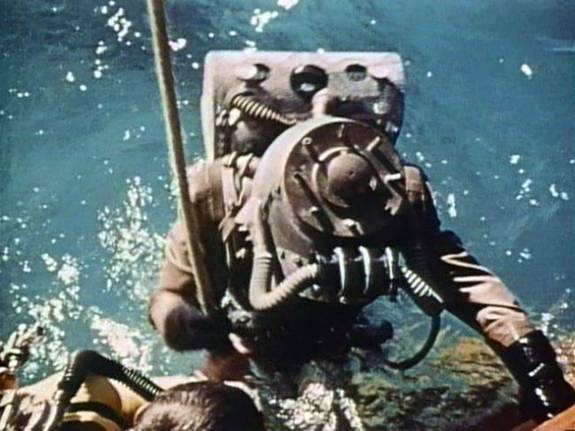 It’s all been done for the sake of doing what the Disney Divers did: walk the bottom of the sea in 20,000 Leagues diving gear, for whatever advantages that might have. An obsession? Perhaps. Was it worth it to me? Definitely. Not only from the personal satisfaction (and fun) I’ve gained in doing this; but in the acknowledgement and support we’ve received from other Leaguers, people associated with Disney and 20,000 Leagues, leaders in the helmet diving community, major publications, world-class museums, and websites related to this subject around the World. Thank you. I’m happy you’ve enjoyed seeing this as much as I’ve enjoyed doing it. 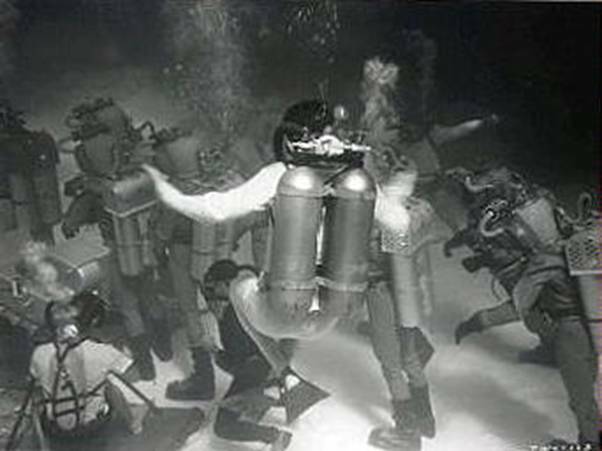 But what I’ve really gained from all this is a real appreciation of what it was like for the Disney Divers, operating experimental equipment back in the 50’s when SCUBA was still in its infancy. The only way one can truly understand what it was really like is to dive one of these rigs, and I consider myself fortunate for being able to do that. The experience has given me a greater insight into the movie, and more understanding and respect for the Disney Divers than I could have had without it. What they did way back then was truly amazing by any standard, and it’s been both a joy and a privilege to share something akin to that experience in my lifetime. Thank you for the inspiration, gentlemen. I salute you all. New! In October of 2007, our friends got together to stage an event that, because of its nature and complexity, we came to call OPERATION UNDERSEA TWO; again in honor of the Disney Divers. And to that we might add, “The best way to understand what the original Operation Undersea was like is to attempt something similar.” On a smaller scale, the Vulcania volunteers did precisely that, and it was an amazing experience for all involved. We’ll be posting a page about OPERATION UNDERSEA TWO here at VSC in the foreseeable future. 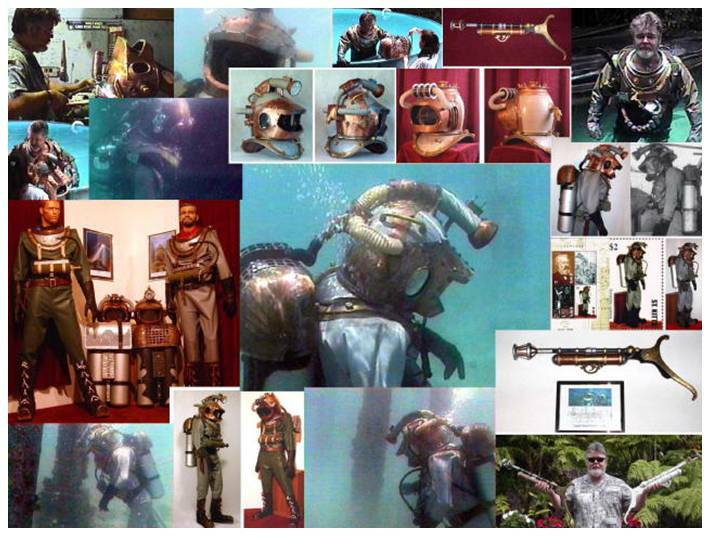 Meanwhile, we’d like to continue our tribute to the Disney Divers by posting this photo collage representing the experience of diving, filming, and photographing our functional replicas of these amazing diving rigs in the environment for which they were intended: the sea.